Discover Corralejo for great shops, bars and Restaurants. 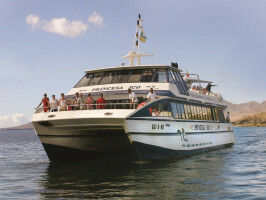 Spend a day in the neighboring island of Fuerteventura in this great value ferry deal. 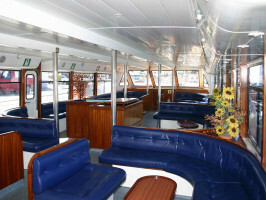 Let us book your ticket from the port of Playa Blanca in Lanzarote across to Corralejo in Fuerteventura. 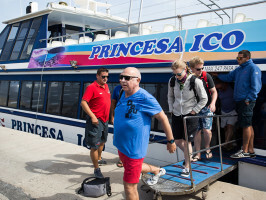 The crossing only takes 40 - 45 minutes in the Princess Ico, Princess Yaiza or Graciosero, moderns ferries operated 8 crossings a day. Corralejo itself is a traditional fishing village and modern holiday resort with over 11km of sand beaches and dunes just outside the town. The small uninhabited island and nature reserve of Lobos just a short ferry ride from Corralejos and is well worth a visit. The crossing takes about 30 or 35 minutes. ACE-FUE: 09:30am*, 10:30am, 12pm, 4:15pm. FUE-ACE: 10:30am*, 11:30am, 1pm, 5:15pm. We strongly suggest clients arrive at least 35 minutes prior to departure time. If you have booked a return ticket, you must reconfirm the time you want to return in destination. Meeting point: Playa Blanca Harbour, Playa Blanca, 35580. Lanzarote - Fuerteventura: 09:30*, 10:30, 12:30, 16:30. 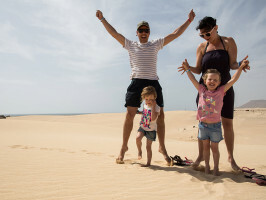 Fuerteventura - Lanzarote: 10:30*, 11:30, 13:30, 17:30. Remember that you must submit your booking voucher to the Videocosta / Lineas Romero Ferry ticket office and please do not forget to bring your ID. Please ensure you arrive at the meeting point at least 30 minutes prior to the start time.